Prints and Photographs Division, Library of Congress On March 8th, 1862, the Confederate ironclad Virginia, defeated two federal warships at Hampton Roads, VA, and forced another aground. When the Virginia returned the following day, intent on inflicting further damage to the Union fleet, she was met by the U.S.S. Monitor and the world's first battle between ironclads took place. After hours of combat, the battle ended with neither side gaining a clear victory. The only clear result was the triumph of iron over wood in naval warfare. The U.S.S. Monitor was, however, the more progressive design of the two. 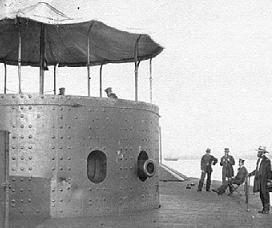 Instead of mounting rows of cannon in a casemate like the Virginia, Monitor was armed with only two cannon mounted inside a rotating turret. Those two cannon were 11 in. Dalgrens, the largest artillery pieces used by the Navy at that time. These cannon were capable of firing 168 pound projectiles using a powder charge of up to 30 pounds (Although during the battle, they were only loaded with half charges because of fears that they might breach if given a full charge). The Monitor's guns were produced at the West Point Foundry.